Williams completed a successful first test of its KERS system at Valencia today despite never having run the system fully operational on-track before. The team did not run the hybrid system during the 2009 season and has abandoned the flywheel hybrid system to develop its own battery-based KERS for the return of the technology this year. Pastor Maldonado completed a total of 101 laps with the system engaged and technical director Sam Michael was pleased with the reliability after losing three hours of track time on the first day of the test with a KERS problem suffered when the system was not active. "We turned KERS on today for the first lap and did 100 laps on it," said Michael. "Within five laps we were on full power and we ran it all day. "We just started running KERS today, although we had bits and pieces on the car before and we haven't had any problems." 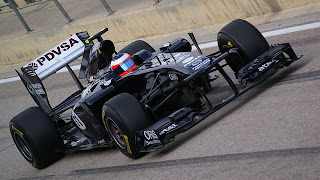 Maldonado ended the day seventh fastest overall and fourth fastest 2011 car, meaning that Williams finished the test with a productive day after losing some track time on Tuesday and Wednesday. "It's been good," said Michael of the test overall. "We basically had five hours of downtime - three hours with the KERS motor problem on day one and then an electrical fault yesterday that cost us two hours. But apart from that, the car ran. "We got some good mileage on it, understood all of the systems, got temperatures and pressures, seeing what rubs and what doesn't, looking at the internal conditions of the mechanical parts and it's all not bad. We had a few little problems here and there, but it's all solid." Michael is reserving judgement as to the overall potential of the new Williams FW33, but is confident that the fundamental design has good potential. "It's too early to tell because you don't know what fuel loads people are running," said Michael. "This is a very peculiar track because the lift/drag ratio is less than 1:1, so you need to get onto some proper tracks before you see anything. "All of the cars will change before the first race, but there is nothing conceptually on our car that is fundamentally different than any other car, except for probably Renault with its exhaust."